CELEBRATING anniversaries is an old American custom and no one should be surprised that it is being perpetuated in A.A. Unfortunately, however, anniversaries in A.A., or particularly the emphasis put on them, can boomerang–and often do-into something far more serious than the harmless birthday fetes held elsewhere. There’s dynamite in A.A. anniversaries. To begin with, the celebration of anniversaries runs contrary to several of the fundamentals of A.A. philosophy. One of these is the idea embodied in “the 24 hour plan” that we should not try to look ahead of the present in measuring our sobriety. We do not set out to stay sober one year, three or a lifetime. Our goal is just 24 hours–just the present–and if necessary we break the 24 hours into even smaller units of time. CELEBRATION of the personal anniversary inevitably turns thoughts not only backwards but ahead to the next anniversary, again setting up the psychological yardstick which the founders of A.A. found they did best without. Another bit of A.A. philosophy which the personal anniversary contradicts is expressed in the wise observation that it’s not the length but “the quality of your sobriety that counts.” How often that has been proved! Over and over, again and again, events have demonstrated, sometimes tragically, sometimes happily, that the test of security in sobriety is not how long in A.A. but how well founded in A.A. Everyone knows of those unfortunate cases of the “oldtimer” who has been in several years and then has a slip. He knows, too, on the other hand, of “newcomers” who in a shorter span of time have progressed much farther along the road of personal recovery. CELEBRATION of anniversaries also tends to build up an “aristocracy of oldtimers,” a kind of class system by which one is supposed to move up from the ranks of the herd into a more select group whose prestige depends on the number of years they have been around. That certainly is inconsistent with the democracy of A.A. Likewise, the implication that through this “aging” process one is graduated from pupil to master does not jibe with the premise that one does not arrest alcoholism by himself. The whole curative fundamental of A.A. is that he must get help. So how can he become master, ever? It doesn’t make sense. Celebration of personal anniversaries puts an emphasis on time that is not justified by A.A. experience. Rare is the new one in A.A. who does not start counting years for himself when he attends a meeting at which some member’s fourth, fifth or X anniversary is being celebrated by the group with figurative trumpets, orchids and fanfare. Rare, too, is the old one in A.A. who, when he finds himself deferred to and looked up to as an “oldtimer,” does not begin to get at least a suspicion that maybe he does know more, maybe he is a little apart from the herd. From that point it’s not a long step to a recurrence of ego-itis, the same old disease that had a grip on all of us. The observation that it’s not the years but the “quality of your sobriety” that counts is solidly founded on the record of experience. I have never celebrated any of my medallion birthdays. It’s not that important to me. Some of my AA peers tell me its important to show the newcomer that the program works, but my retort to that is, "I’d rather sit down with the newcomer and show them "how it works". 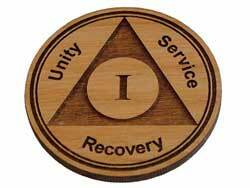 Far too often one’s time in sobriety is used as a "fellowship currency" to establish status and hierarchy in the group. I have seen too many "dry drunks" with substantial sobriety time, strutting about the meeting, posturing themselves above younger members rather than mentoring them in sobriety. However, I do like the ritual of handing out newcomer chips. It lets me know who I should be approaching later in the meeting. Thank you God, for helping me understand the huge difference between abstinence and sobriety. For a couple of years now, I have intentionally stopped talking or mentioning my sobriety time for the purpose of "qualifying" myself…My only qualification is my experience. We do not set out to stay sober for a year, or three, or a lifetime? Not what Dr. Bob said in his story in the Big Book. He said if you really want to stop drinking for good and all that A.A. Has an answer on how to achieve that. Too many today have a defeatist attitude and don’t have goals, and too many argue with the founders. None of us would get in the car with expectation of never arriving at our destination. We hear nowadays that relapse is part of recovery. Yeah, just like fatal accidents are part of driving. None of us wants that or expects it, and we don’t brush them off like they are OK. As has been said, celebrating an anniversary should be an occasion of humility but should be done because it shows that we can recover when we actually do the program, just as it says in the Big Book.